BANGI, 22 Oct, 2012 – The role of psychologists is in urgent need of official recognition through a Psychologists Act just as counsellors already have such an acknowledgement through the Counselling Act. Psychology Professor, Dato’ Dr Wan Mohammad Rafaei Wan Abdul Rahman said the recognition will help in improving the standard and quality of the profession. Prof Wan Rafaei said the United States, Canada, Australia and other countries acknowledge Psychology as a discipline and psychologists in those countries are recognized as professionals. Such an Act would limit the profession to qualified members only so that standards and quality can be assured. 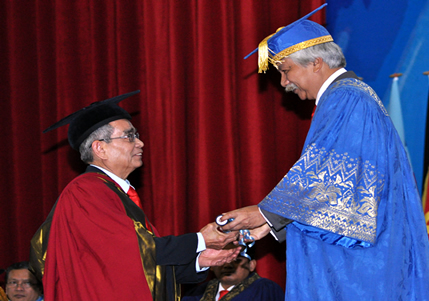 He made the reccomendation in his response to being conferred Professor Emeritus by The National University of Malaysia (UKM) Chancellor, Tuanku Muhriz Ibni Almarhum Tuanku Munawir at the 5th session of UKM’s 40th Convocation here today. Prof Wan Rafaei has been acknowledged as a pioneer of psychology not only in UKM but also the nation. In recognition of his research and scholarship in Malay ethnic psychology, he was appointed to the Chair of Malay Studies at the Victoria University of Wellington, New Zealand since 2010. Long before that he was tasked with helping to set up UKM’s first Psychology Centre in 1972. For Prof Wan Rafaei, it has been like a dream come true. With the support of his parents and siblings, he was able to leave the confines of his village to study at the Malay College Kuala Kangsar and then on to university. He read Psychology at the Newcastle University, Australia in 1967 under a MARA scholarship until he qualified with a Masters degree in 1974. He has the distinction of being the first Asian student at the university to win a gold medal for excellence. He had planned to study pschology from the beginning and was confident that the then new university to be known as UKM would have a department of psychology. UKM was established in May 1970 and he was appointed assistant lecturer in 1972. In 1978, he went to the University of Wales, UK where he earned his Philosophy Doctorate through a Commonwealth scholarship. Prof Wan Rafei also started the country’s first Diploma in Counselling programme in 1980. He paid tribute to wife and family for their steadfast support through out his career which enabled him to realise his dreams.